Michael regularly sends me links to posts on Pharyngula, the "random ejaculations of a godless liberal." PZ Myers is indefatigable: how he manages to have a job (associate professor of biology, University of Minnesota) as well as a private life beyond his website is hard to imagine. He's put up 90+ posts already in August. Be sure to read the last paragraph here before you think Myers is interested only in attacking Islam. His target is far broader. 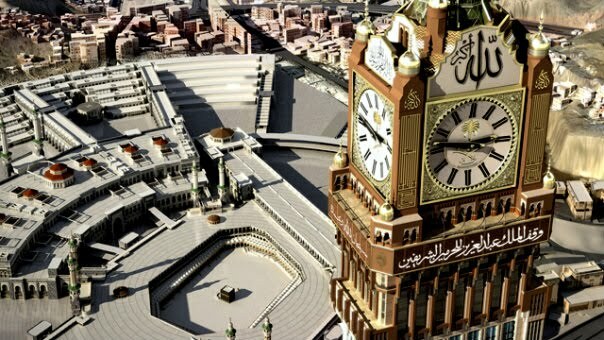 Muslims in Saudi Arabia are building a giant clock that resembles Big Ben, but is over six times larger. 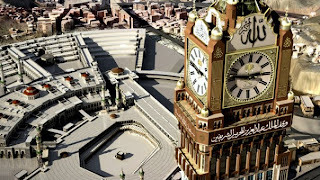 They want to replace Greenwich Mean Time with Mecca Time as the world standard. As Mohammed al-Arkubi, manager of one of the hotels in the complex, put it: "Putting Mecca time in the face of Greenwich Mean Time. This is the goal." This is a beautiful example of cargo cult science. Big Ben has nothing to do with establishing GMT — it's just a big clock in London. GMT is entirely about establishing a uniform standard reference time. It was set rather arbitrarily to the time at an observatory in England, because England was the leading maritime nation at the time and used solar observations relative to Greenwich to determine the longitude of ships at sea. Greenwich time has also been replaced since then by Coordinated Universal Time, which is based on measurements of a world-wide network of atomic clocks, which turn out to be more reliable than figuring out the position of the sun. It's an arbitrary standard, get it? Building a giant clock in the desert will not suddenly attract time to line up with it. Although it does sound like a perfectly kitschy and annoying clock, with bright lights that can be seen 18 miles away that will flash and blink in colors to let people know it is time to pray. I suspect they're also trying to standardize the web back to 1995 html, too. And of course there is more. There is a whole lot of freakish cargo cult science going on down there. What does that even mean? The magnetic north pole is currently located somewhere near Ellesmere Island, in Canada, and it wobbles about a lot, by several miles each year. How can a city in Saudi Arabia be in perfect alignment with an island in Canada? Being at the magnetic north pole, or even aligned with it, doesn't mean there is no magnetism there, it's not going to change how gravity works, and it's not going to zap you with energy. What the Saudis clearly need to do is build a 2000 foot tall horseshoe-shaped magnet in Mecca, cover it with strobe lights and Allah's name, and then pray for the earth's core to rotate and drift in alignment with their little monument. By the way, if you're just laughing at those dumb Muslims, keep in mind that Christians look exactly the same to us atheists. Every one who thinks that the heavens proclaim their petty parochial deity's glory…you're just as wacky and blind as the desert misogynists throwing away their oil wealth on knick-knacks for Allah.